We’re pleased to let you know the new version of the Zap-Map app released on Android in mid-February is working well and is now available across iOS, Android and desktop platforms. 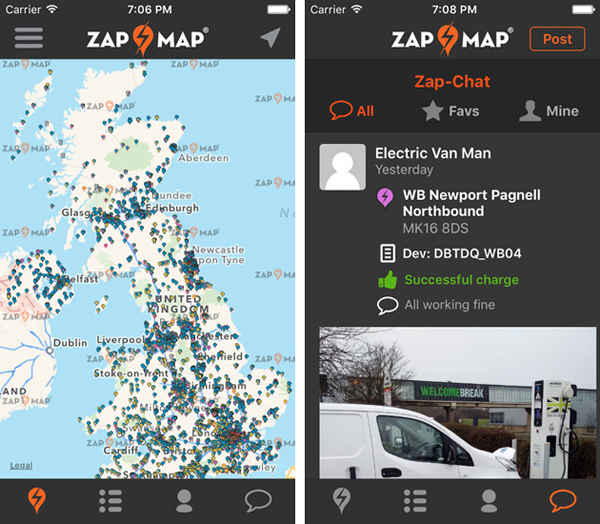 A key new features of Zap-Map is the community update facility Zap-Chat on which you can log a successful charge, update status on a charge point or add a comment / photo about the point directly on the app for the benefit of the EV community. Since release in December there have been over 2,500 posts on Zap-Chat and in the last month there were 1,200 posts – 500 successful charges and 700 status updates; we hope this will continue to grow as the new Android users start posting. In addition to Zap-Chat, we have also added enhanced filters for users to be able to identify points by any combination of EV model, connector, charger speed, network and access. A cross platform Favourites function has also been included, with users able to add a point to a list in their account and view it on any device that they are signed in to. The desktop site hasn’t been ignored either as we rolled-out an improved route finder, tailored to EV users. You can now plan journeys by easily adding way-points and charging locations, filtering chargers and saving favourite routes.